Since Obama’s reelection, he has faced increasing pressure on the topic of global warming, mostly as a result of Hurricane Sandy. Al Gore has been particularly pushy on this subject, calling on Obama to seize the moment and push through some serious climate action. This is a pretty critical message sent at a pretty critical time, as Congress has less than 50 days to work out a budget deal and avoid automatic tax increases and spending cuts. The interesting part of this is that there are even some conservatives who have mentioned the idea of a carbon tax, even before Obama’s reelection. If anything should give hope to environmentalist who support a carbon tax, it is that fact right there. Not only has Obama’s reelection given hope to climate action supporters, but after a summer of record temperatures and extreme drought, 67% of Americans now say climate change is real, up 10% from 2009. Hurricane Sandy also played a role in increasing climate change awareness, with exit polls noting the storm as a factor in many voting decisions. Neither candidate mentioned climate change in the debates, but Obama did bring it up as one of his top three priorities in his victory speech, as well as talking about climate change action in his first post-election press conference just yesterday. 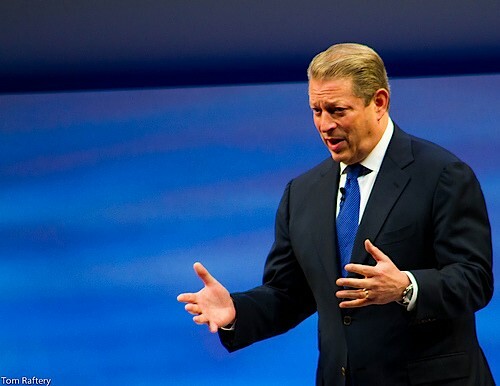 Gore says it is now the public’s job to keep the pressure on. A demonstration at the White House on November 18 to demand Obama block the Keystone XL pipeline is just one way the public can work on it. Do you think Gore is right? Is a carbon tax one of the best alternatives we have right now to work on the climate AND the deficit?